11/5/2016 - OECD countries agreed today to invite Latvia to become a member of the Organisation – a move that would extend OECD’s membership to 35 countries. Marten Kokk, Dean of the Organisation's governing Council said: “OECD Member States welcome the successful conclusion of the negotiations with Latvia and its accession to the OECD. “Latvia has implemented wide-ranging structural reforms to establish a modern market economy after it restored its independence in 1991 and joining the OECD is an important acknowledgement of those efforts after joining the EU in 2004 and Euro area at the beginning of 2014. In statements made at a meeting of the Organisation's governing Council, OECD countries expressed the wish that membership in the Organisation will bring Latvia closer to OECD standards in all fields. 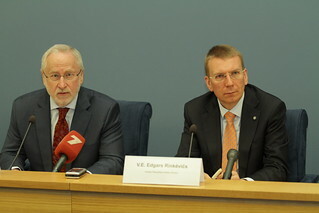 During nearly three years of accession discussions, Latvia has been reviewed by 21 OECD Committees on two fronts: an evaluation of Latvia’s willingness and ability to implement substantive OECD legal instruments, as well as an evaluation of Latvia’s policies and practices as compared to OECD best policies and practices. For countries seeking to join the OECD such as Latvia, the accession process itself can serve as a catalyst for important reforms and support domestic policy agendas. For example, as part of its accession process, Latvia has committed to the re-establishment of boards of directors in all large commercial state-owned enterprises and has improved its anti-money laundering regulations. Many of Latvia’s priorities are already in line with the OECD’s agenda – for example reducing inequalities, maximising trade and investment, fostering innovation, fighting corruption and optimising the effectiveness of education, health and labour market policies. OECD membership will allow Latvia to further tap into the vast reservoir of OECD expertise, advice and policy dialogue in order to support policy-makers and reformers. OECD members will also have a greater access to Latvia’s experience in different fields and will be able to learn from it. Latvia was invited to open accession talks in 2013, along with Colombia. Membership talks with Colombia are continuing, and in April 2015 the Council decided to open accession discussions with Costa Rica and Lithuania. In parallel, the OECD is strengthening its growing partnership with major emerging economies, including Brazil, China, India, Indonesia and South Africa. Specific country programmes are ongoing with Kazakhstan, Morocco and Peru. For further information journalists are invited to contact the OECD's Media division on + 33 1 45 24 80 90. Read our Q&As on Latvia's accession. More information on OECD's work on Latvia: www.oecd.org/latvia/. More information on how accession to the OECD works: www.oecd.org/about/membersandpartners/enlargement.htm.